This is good stuff. 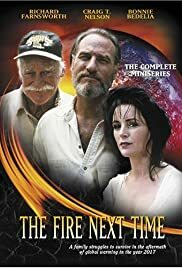 A TV movie about Global Warming in 1993? Believe it, and I've been thinking lately how predictive it was. I think more than just the events surrounding them are the people's response to them that grabbed me. The human drama derived out of the confusion is very gripping. There's a sense of emergency in the air with all the wildfires and smoke. Bad weather, emergency response stretched thin. You definitely get the sense of these characters are worn out and exhausted from the heat and insanity of what's going on around them. The family drama, though, doesn't seem as canned as the Day After Tomarrow, another state-of-emergency type film. The cast was also top notch for a made for TV movie. I only saw this when it aired in my teens, but it's stayed with me since.